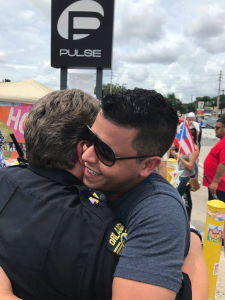 “Alone we feel… together we heal,” was Pulse nightclub Josh Garcia’s first thought as he began emerging from a cocoon of grief and depression following the senseless act of hate in Orlando, Florida. Stars of HOPE’s Director of Operations and Programs, Josh Garcia, credits the powerful Stars he received for being an integral component of helping him heal. Josh said tons of mail was coming into Pulse following the tragedy but it was two boys and their mother who stopped by his office a few days after the shooting to give him Stars that immediately touched him to the “core.” The mother explained they were compelled to do something and that Stars of HOPE allowed them to do something positive for someone else and create a smile. “The following day, three women came with boxes of Stars created by Universal Lowes Hotels,” explained Josh. In fact, Universal Lowes Hotels had created 1,000 Stars for Orlando. “These three women all endured tragedy in their own lives after both natural and human-caused tragedies. They immediately opened their arms and shared their stories with me.” Josh invited the ladies to the office to share hope. “I was almost sure the staff would respond the same way I did the day before.” And that they did. “As they searched through the boxes of Stars of HOPE, they found the star that ‘spoke’ to them. They read the messages on the back and I started to witness small smiles. In return, this helped me heal a little inside. It gave me a glimpse of hope for them and reminded me there is still good in the world during such a dark time.” It also gave Josh a glimpse of the incredible healing power found in the survivor to survivor human connectivity. Little did he know, it was only just the beginning.